The Skripal Files tells the story of Sergei Skripal, the complex and mysterious victim from this year's most explosive news story. Mark Urban interviewed Skripal in the months before the poisoning and explains how Skripal's life has come to define the new spy war between Russia and the West. 4 March 2018, Salisbury, England. Sergei Skripal and his daughter Yulia were enjoying a rare and peaceful Sunday spent together, completely unaware that they had been poisoned with the deadly nerve agent Novichok. Hours later both were found slumped on a park bench close to death. Following their attempted murders on British soil, Russia was publicly accused by the West of carrying out the attack, marking a new low for international relations between the two since the end of the Cold War. The Skripal Files is the definitive account of how Skripal's story fits into the wider context of the new spy war between Russia and the West. 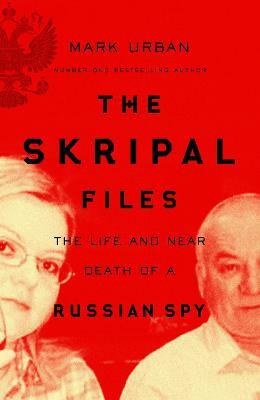 The book explores the time Skripal spent as a spy in the Russian military intelligence, how he was turned to work as an agent by MI6, his imprisonment in Russia and his eventual release as part of a spy-swap that would bring him to Salisbury where, on that fateful day, he and his daughter found themselves fighting for their lives. Mark Urban is a broadcaster and historian. Priory to working for the BBC he was defence correspondent for the Independent for four years, covering the end of the Cold War and the Soviet withdrawal from Afghanistan. He is also the acclaimed author of Task Force Black: The explosive true story of the SAS and the secret war in Iraq; Big Boys' Rules: The SAS and the secret struggle against the IRA and Rifles: Six years with Wellington's legendary sharpshooters. Mark read international relations at the London School of Economics and served for a short time in the British army.